Some of these rescues [below] are courtesy listings so please read to the end of each Bio to determine who to contact. New postings are not always on first page, so please take a look at all the pages! All references will be checked and a Home Visit will be arranged at your convenience. You must be over 30 years of age and/or own your home for permanent adoption, but we do consider those under 30 for temporary fostering. Please Please help! Donations Needed Desperately!! Do You Know Where Your Dog is? When you purchase a GPS Whistle Tracker from our link http://ltwr.whistleshelters.com/ you receive $15-25 off the purchase price depending on your choices! 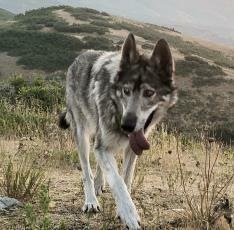 Lake Tahoe Wolf Rescue also gets a nice little donation. Use coupon code SHELTERLOVE when Checking Out. I bought one for my dog and I LOVE it. I always know where he is no matter where I am on the globe as long as I have cell service or computer internet service. Get one for all your dogs! Wish I had one for my husband! VERY Urgent! 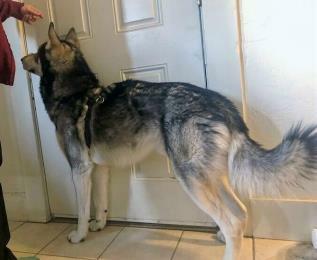 Please help this fellow...Tucson, AZ - this beautiful young 1 1/2-year-old Loki needs a home right away. His owners had to move and cannot afford a home with a fenced yard. He has been used to running on acreage at his previous home and is going a little nutty being cooped up in a small place. He is becoming destructive when left home alone and will try to dig out of his enclosure to get the exercise he is used to getting. Loki is a young pup and just becoming mature and needs daily exercise and training to keep him happy and calm. He is really a sweetheart, loves people and good with other dogs. He lives with a cat but likes to Play and chase so we won't be placing him in a home with cats or small children. 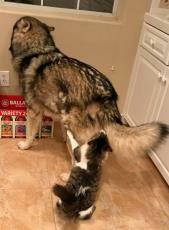 He is ok with small dogs but plays a little rough, so we prefer not to place him with little dogs. Friends visiting should be fine. This boy needs to go into a nice, forever home with someone that is active, home a lot (works at home, retired or can take with) or has a nice escape-proof yard, and who will continue his training. It would be nice if he has a sweet female canine to play with as well. Transportation help is available. It would be nice to get Loki into a cooler climate like Colorado or the Sierra. Please contact us if you would like to meet this young beautyboy. Loki needs to be neutered before adoption! anxiety when Indy is not around. She does not try to escape unless Indy is out and she will do anything to be with her. 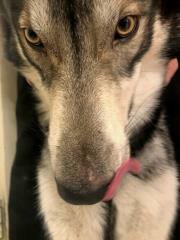 Lucy is content to stay in her enclosure so we would like to find someone with a nice big yard for jboth dogs. Usually good in 6' fencing. 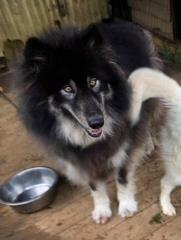 Photo shows Lucy with coat all brushed out and looking beautiful. Lucy is a bit shy with humans and loves to be around dogs. She has no food aggression at all. She is in good health and playful. Lucy is a bit nervous in the car and does best riding in a kennel where she feels secure. 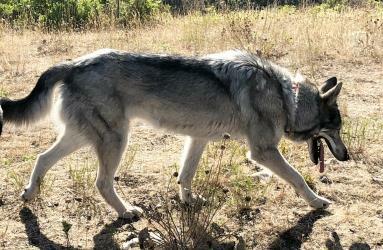 She is difficult to leash up as she is very shy, but will go anywhere Indy goes. Here is a photo of Lucy with her winter coat. What a beauty! 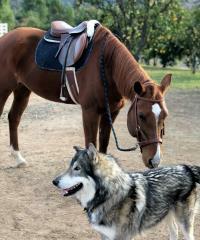 Indy is Lucy's best friend and she is about 7 years old. 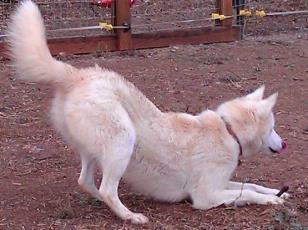 She is the pretty White German Shepherd/Husky girl, spayed and up to date on vaccinations . She is good with other dogs but with larger, friendly males she is best. No small dogs or cats please. She walks nicely on leash but is not getting out much these days. 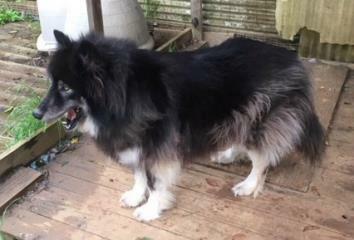 Indy is VERY well behaved indoors and is housetrained, but has been stuck living outside with Lucy for 5 years now. Indy is crate trained in the car and was fine when left home alone. She dug out of her pen a few times because she is not getting the daily exercise she needs, but dig guard is recommended with at least 6' fencing. Indy knows some basic training however owner has done nothing with her in a long time. Very sad for these girls. Indy loves going places with you but has been a backyard dog living outside for 5 years now. Indy is an amazing girl - she loves people and wants to say hello to everyone and just be loved on. She loves to cuddle and wants to sleep next to you. Unfortunately after Lucy arrived her lifestyle was changed and she became Lucy's management piece. Indy is a wonderful girl and loves being with people - but Lucy is a complete wreck without her so Indy has to stay outside with her. URGENT! 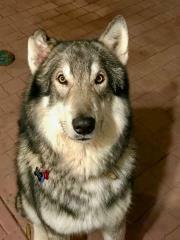 Bountiful, UT - Chief is a pretty 5-year-old neutered male that needs a home right away. 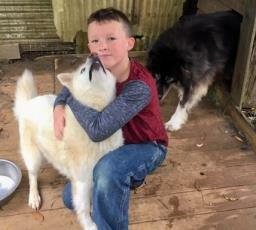 Owner loves his boy but the environment is just not suited for this shy boy. City life has too many conflicts sometimes - sirens, loud trucks, cats running around, bicycles flying by, etc. The owner has secure containment but that does not keep the cats from coming in and the neighbor complains if one of their cats gets killed or injured. 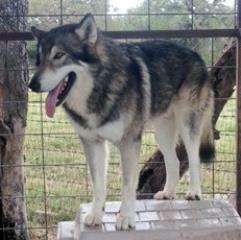 Chief is cautious and shy with humans but friendly once he gets to know you. 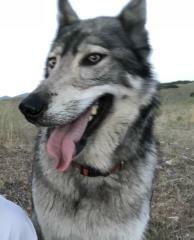 Typical of this breed and why we always look for someone with wolfdog experience. He is also good with most other dogs and occasionally gets skittish and runs away if a dog becomes aggressive. Generally Chief is fine as he was well socialized with other dogs when he was a pup. We prefer a new home without cats, small dogs or children as Chief likes a calm and disciplined environment. He can be a digger or anxious if left home alone so a new home with secure containment - 7' fencing with dig guard - and an owner that has time to take him hiking would be great for this beautiful boy as he is good off leash running on trails once he is familiar with the area. Contact Pamela Jo at PamelaJoWolflady2@sbcglobal.net for an Application and Home Check arranged. Transportation help available. San Diego, CA Gorgeous 5-1/2 y/o Jax has been in our Foster home waiting for his forever home to come along. Now is the time!